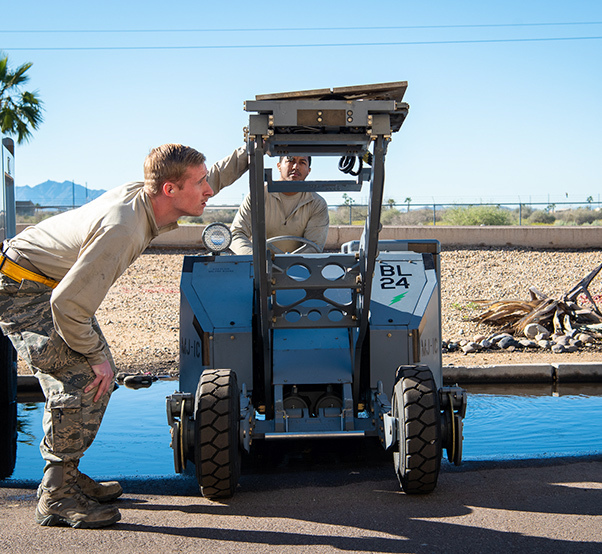 Airman 1st Class Connor Blankenship, 56th Equipment Maintenance Squadron Aerospace Ground Equipment maintainer inspects a jammer lift plate, March 14, 2019, at Luke Air Force Base, Ariz. AGE is responsible for ensuring the readiness and safe use of all equipment used by crew chiefs and weapon loaders. The 56th Equipment Maintenance Squadron Aerospace Ground Equipment Flight at Luke Air Force Base, Ariz., moved its F-35A Lightning II operations to a vacant building left by the F-16 Fighting Falcon engine shop. The move allowed them to spread out and be closer to the Aircraft Maintenance Units they routinely work with. Moving into the new building has been in process since 2015, being finalized as of Dec. 2018. Once the final transition process was set in motion it took six months to move over 100 personnel and 400 pieces of equipment into their new work stations. AGE is tasked with maintaining equipment that directly supports almost every system in an aircraft. In an average year the flight completes approximately 34,000 equipment dispatches, 7,500 service inspections, 7,000 maintenance tasks and 1,000 scheduled inspections. 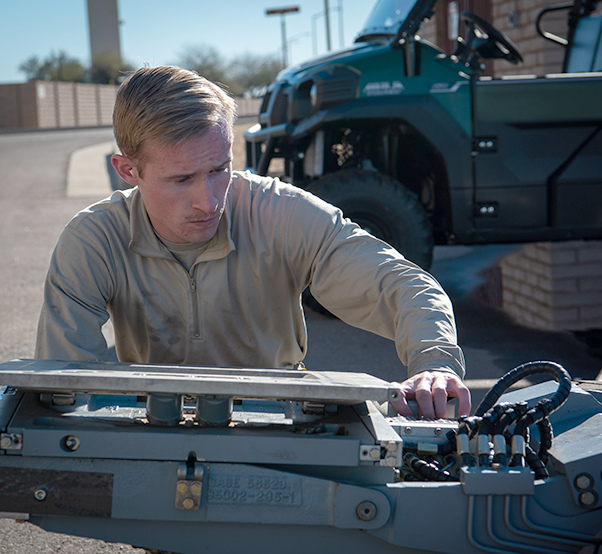 Airman 1st Class Connor Blankenship, 56th Equipment Maintenance Squadron Aerospace Ground Equipment maintainer, operates a jammer plate, March 14, 2019, at Luke Air Force Base, Ariz. The AGE flight supports the 56th Fighter Wing in their mission to train the world’s greatest fighter pilots by ensuring all equipment needed to prepare for a sortie is ready. 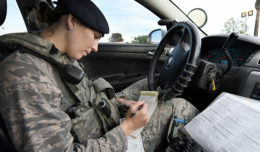 With all the equipment AGE is responsible for, their top priority is ensuring cleanliness and safety of use, all while maintaining an under 15 minute goal every time their called out to the flightline. Because the F-35 is the newest fifth generation fighter jet, training to be an F-35 AGE maintainer after technical school takes a little longer than most, taking eight to 10 months to complete which is longer by an average of six months. After the training has been accomplished, the AGE maintainer becomes one of the most important shops in completion of the 56th Fighter Wing mission of training the world’s greatest fighter pilots. 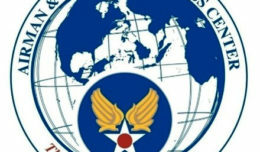 The 56th Equipment Maintenance Squadron Aerospace Ground Equipment Flight moved its F-35A Lightning II operations to a vacant building left by the F-16 Fighting Falcon engine shop. Staff Sgt. 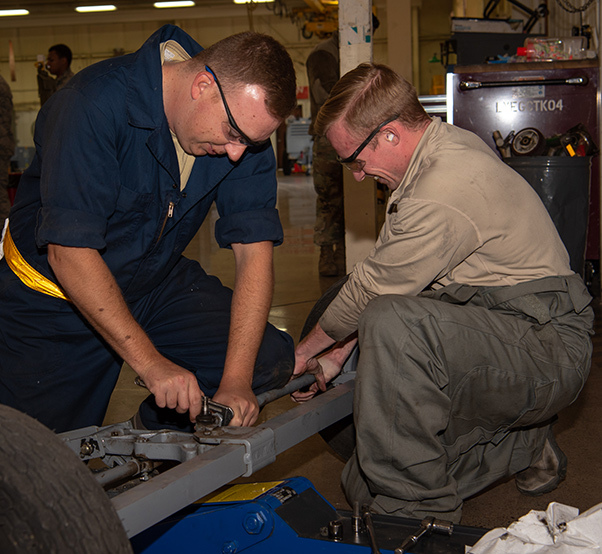 Brad Davis and Airman 1st Class Connor Blankenship 56th Equipment Maintenance Squadron Aerospace Ground Equipment maintainers replace a part on an axel, March 14, 2019, at Luke Air Force Base, Ariz. AGE is responsible for maintaining equipment that directly supports the hydraulic and electrical systems in an aircraft.